Friends, family and fans can save 10% off all tickets they order by using the discount code: “Antandra”. Use it and save a minimum of $10 per ticket. ONE EVENT REALLY CAN CHANGE YOUR LIFE! A CONSCIOUS EVENT… FOR A CONSCIOUS WORLD! 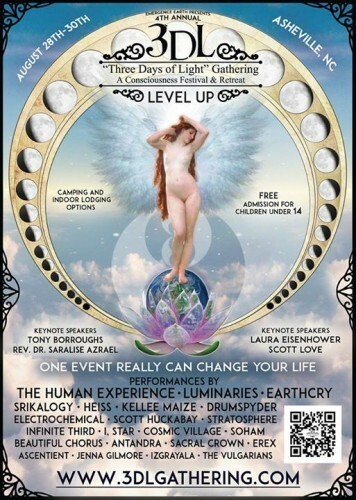 Tier 1 Tickets on sale now starting at just $100 including camping for the whole weekend and all workshops, events, speaking engagements, concerts, and more. We are coming to this from everywhere. From all corners of the Earth… from all walks of life. We are the many faces of… CHANGE. WE are the 3DL Family! We are moved to be the “very best we can be. You would say that we are “Inspired” (In the Spirit?) to simply be… more. More knowledgeable. More intuitive. More prepared for… the future. We feel this INSPIRATION! and take steps toward actually “being the change we wish to see in the world. At the Three Days of Light Gathering we will attend workshops, have conversations and learn about many things. From planting a more healthy garden to feed ourselves, our families, or communities… to how to feel more whole and connected to a “higher” or “guiding” source of… EVERYTHING. (Call it what you will, you know what we are saying! 🙂 ) You will be with friends and family who are also there to connect with, learn from, and teach, everyone else there. We are peers. We are each others teachers. INSPIRATION! We will set intentions and share our VISION. We will hold space with the potential that we REALLY CAN BE our highest selves. and there will be many chances to enter into an agreement with OURSELVES to simply be better. Less dense, LIGHTER. There will be a moment during your time with each other that we will ACTIVELY feel a shift take place. A part deep inside of us will ACTIVATE and from that moment on we will forever be a bit more WHOLE, complete. READY. To let go. Of pain, shame, guilt. We will see that everything that we have experienced before that very moment (or THIS very moment, possibly?) was a necessary part or our JOURNEY. All the lessons merely parts of the story that we needed to understand before we “MOVED ON!” into being our most evolved selves. It’s about coming to terms with our past, knowing our present, and getting ready for the FUTURE. We decide to make CONSCIOUS CHOICES, and with that we become ACTIVATED! WE come together (To-Gather) in celebration of life. This is Festive part of 3DL as being a “Festival”. We laugh, we dance, we sing, we CELEBRATE! the beauty and wonder of life. Wonderfull! With so many amazing artists, performances (Musical and other), crafters and creators, our hearts will burst open with joy and such powerful elation… the colors, the sounds, the FEEEEEEELING of absolute, real and genuine LOVE… and we will feel supported and safe to BE HAPPY and FREE! The Three Days of Light Gathering is a glimpse at a world that we really CAN CREATE. A world where trust and hope are the norms. Where we protect each other simply by saying… “YES! I KNOW WHAT YOU FEEL!” With a smile and, if we are blessed, a warm loving embrace. And 3DL is a demonstration, to our children that there is more to life and living than how we “normally” live. It shows them that there it is possible to experience life with hope and that we can be rewarded for walking the path of being radiant, loving people. If you feel it in your heart to come to the THREE DAYS OF LIGHT then we welcome you with open arms. 3DL is a holistic learning based retreat by day, filled with Workshops, Playshops, Yoga, and Ceremony. There are Activities and Adventures, Art and all kinds of interesting creative projects meant to bring out the inner CREATIVE GENIUS! Or you can relax in the BEAUTIFUL natural, awe-inspiring organic wonder of the Appalachian Mountains! THREE DAYS OF LIGHT GATHERING is a PORTAL… a STARGATE of energy channeling through us and focusing like a laser beam of LIGHT that we use to manifest the world of our dreams. STARTING RIGHT NOW! We have created the THREE DAYS OF LIGHT to be VERY AFFORDABLE. Accessible to anyone and everyone who feels it in there hearts to be there. Even our most expensive registration level is less than the price of a hotel for the weekend. for you to learn and heal in. (Auther: The Code. Creator of “The Ten Intentions for a Better world, and founder of “The Intenders Circles. Scott will be re-introducing “The Visioneering Process” and talking about the process of creating the vision in your heart and head. Founder of The Emergence Earth Project, The 11.11.11. Gathering (Sedona) and the Three Days of Light Gathering, he will speak about when and how to listen to that voice in your head, and BELIEVING that it’s not crazy to follow your heart. His talk will be followed by a round table discussion and meditation meant to clear away doubt and open ourselves up to Intuitive Guidance. I chose to incarnate on this occasion to be of absolute service to humanity. I have often been referred to as a Catalyst, and a Spiritual Broadcast Station, spreading love and joy wherever I go. I am not afraid to go deep within Spirit to assist in answering deep questions, as we are all One. My intention is to be available with your Angelic Team and Spirit Guides and Record Keepers of your Soul to bring you to a place of wholeness, enlightenment and full embodiment. Your Guides and Teachers may not always give you the answer that you are looking for, but you will know that it is of Divine Truth, and coming from an Authentic Safe Place. So if you have read all this, first of all… AWESOME! And second of all, you now have some idea of all the awesomeness we have in store for this, what is bound to be our most expansive and more powerful 3DL to date, and how this trully is one of THE MOST conscious and transformational events of the year. *Please keep in mind that this is a drug and and alcohol free event. *Parking is off site and shuttles will be provided. How do we bring in THE WORLD AND THE LIFE OUR DREAMS? ONE CONSCIOUS CHOICE AT A TIME. We hope you chose to join us @ the Three Days of Light Gathering this year. Your energy, ideas and vision is important!